Southampton-based HealthQuest Solutions has been awarded a £960,000 contract by the UK government's Small Business Research Initiative (SBRI) to further develop its myCOPD Solution. myCOPD Solution supports the principles of self-management by improving patient knowledge and skills. 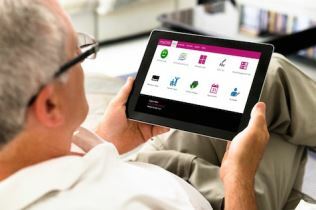 It also tackles the emotional aspects of having a long-term condition through the use of online educational pages as well as videos showing the correct inhaler techniques, relaxation skills and exercise tips. This is the second contract to be awarded and follows the successful first phase which trialled the system with 36 patients over a six-month period. The project measured symptoms using the COPD Assessment Tool (CAT) score and assessed their inhaler techniques, which revealed that providing COPD patients with access to an advanced electronic self management system, such as myCOPD Solution, significantly improves their symptoms and inhaler technique. From a starting point of 98% of patients not using their inhalers properly, now 98% are using them correctly as a direct result of myCOPD Solution. It was this success that helped secure the second phase of the SBRI contract, an investment programme which connects public sector challenges with innovative ideas from the private sector. SBRI’s financial awards aim to help businesses achieve and fast track government objectives and stimulate economic growth.